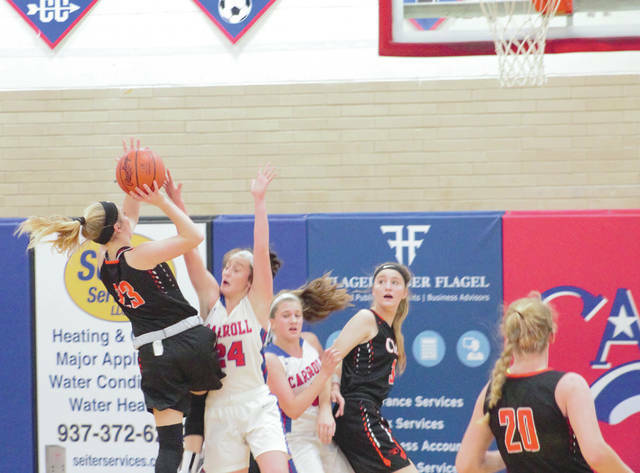 Beavercreek sophomore Maggie Holstein makes a contested jump shot over Carroll junior Allie Stefanek, Jan. 23 at Carroll High School in Riverside. Carroll sophomore Megan Leraas draws in the Beavercreek defense and gets an easy assist for a wide open three, during Wednesday’s Jan. 23 girls high school basketball game in Riverside. 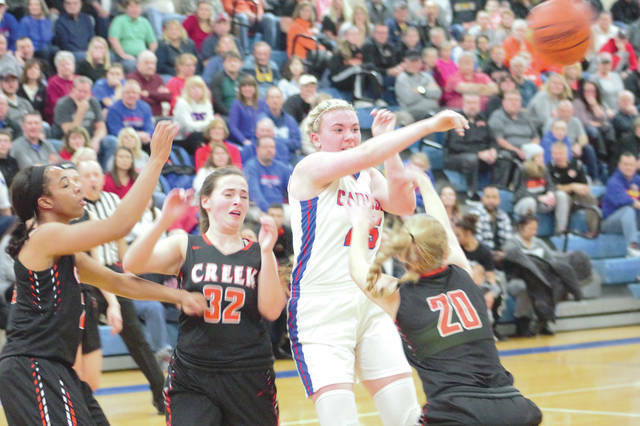 RIVERSIDE — The Beavercreek Beavers high school girls basketball team came ready to play when they went up against the Carroll Patriots who came into the game ranked as the No. 1 Division II team in Ohio with a 15-0 record. The Beavers moved to 10-6 as they handed the Patriots their first loss of the season by a score of 57-44. The team relied on strong defense to facilitate its game plan: Limit Carroll, and score its own easy buckets on the other end. “We knew they liked to penetrate the defense and shoot threes, so we tried to take away the easy shots inside and limit them to tougher threes,” Zink said. At halftime, the Beavers only had a four-point lead. However, the Beavers began to pull away in the beginning of the third quarter as they started scoring multiple three pointers in a row. It gave them a 10-point lead that they never relinquished. “They are so well coached and such a good team, I never felt safe with the lead until it was over,” Zink said. Senior Taylor Steinbrunner led the beavers with 21 points, while senior Elizabeth Bush led the Patriots with 12. The Patriots will look to rebound after their first loss of the season and use this game as a learning opportunity. “This was an opportunity to see some of our weaknesses and work on it before the tournament,” Carroll coach Cecilia Grosselin said. She said the girls spoke in the locker room as a team and shared their own input about their mistakes and how they need to adjust. “As a team, we need to play better together and trust each other a little more,” Grosselin said. Carroll hopes to move on from this game stronger than before. They’ll face another tough Division I team, Fairmont, at 7:30 p.m. Monday, Jan. 28 at Trent Arena in Kettering. Beavercreek will play another nonleague game at 7:30 p.m. Thursday Jan. 24 at Chaminade Julienne in Dayton.